The Fabrini missiles pose no threat to a Constitution-class ship. They operate on chemical fuel and are capable of sublight flight only. 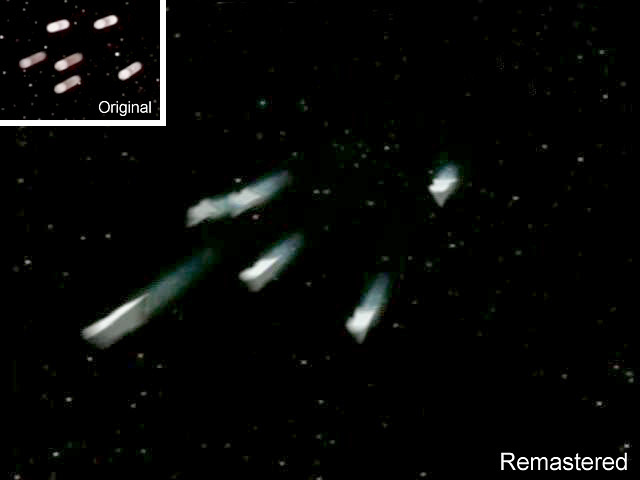 The missiles, essentially just light tubes, appeared in TOS: "For the World is Hollow and I Have Touched the Sky". 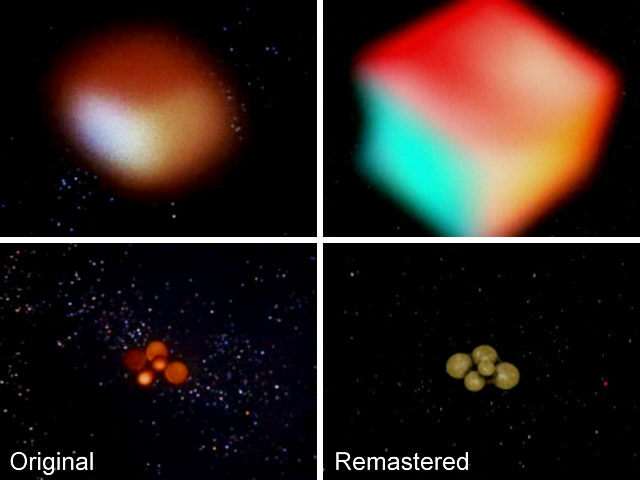 In the remastered version of the episode the simple tubes were replaced with somewhat more detailed CGI versions. This is a hollow asteroid with atomic sublight propulsion that serves as a generational ship, carrying the descents of the ancient Fabrini civilization. Its propulsion system leaves a trail of debris and hard radiation. 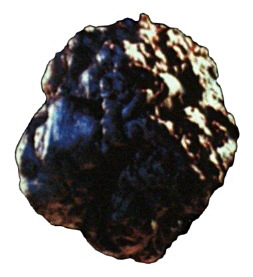 The original Yonada was a slightly egg-shaped body with a comparably smooth and reflective surface (a bit like volcanic rock which would be very unusual in space). The reflections in blue and red seemed to be rather unrealistic because where could all the light come from? While the basic proportions are similar, the remastered version looks blunt and dark, more like an ordinary generic planetoid. A network of hover trains sprawls across Farius Prime as a public transportation system. 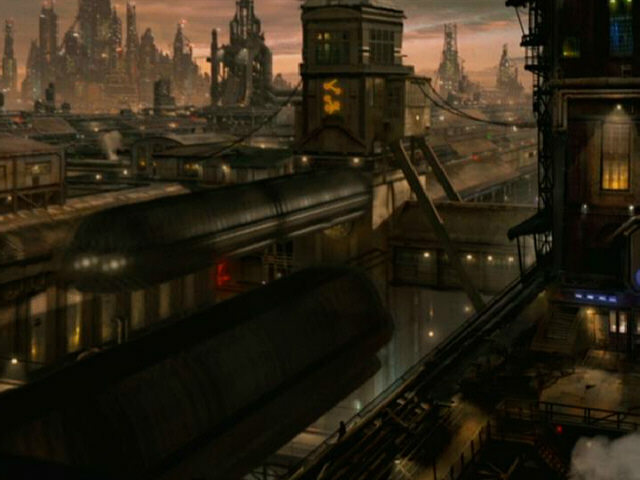 A couple of trains could be seen passing by in DS9: "Honor Among Thieves", hovering well above the ground. Their principle seems to be much like the one of the air tram in San Francisco. The affiliation of the planet Farius Prime is uncertain. As it's an untidy and dangerous place, I assume it doesn't belong to the Federation. A small brightly illuminated buoy shaped as a cube warns alien ships from entering the region of space claimed by the First Federation. It is impervious to sensors and using unknown technology to block a starship's flight path. The buoy is explicitly stated to measure 107m. 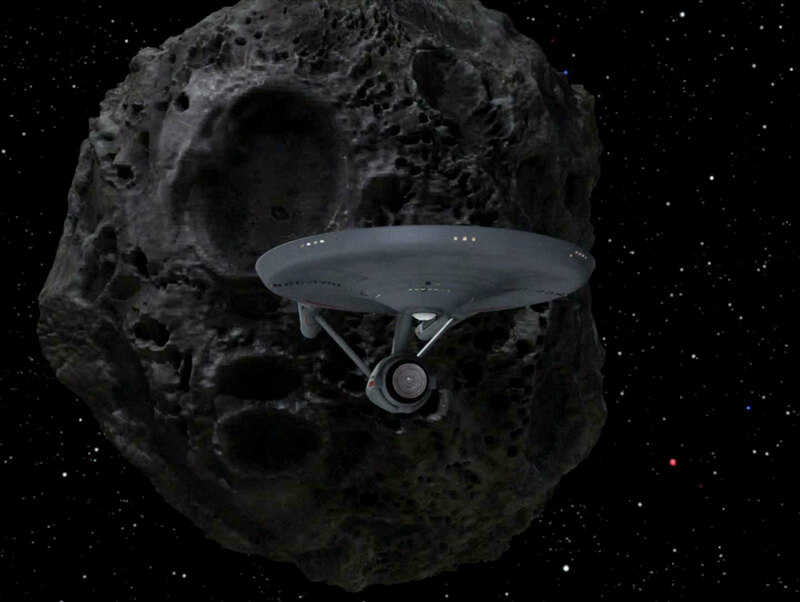 In one shot the cube can be seen directly ahead of the Enterprise, illuminating the ship's saucer edge. Here it looks like it is less than 20m long though. The buoy was reconstructed for the remastered version. It looks the same as in TOS but not quite as blurry. This huge spherical vessel dwarfs a Constitution-class vessel and may be heavily armed. It seems to be a modular design. Parts of its hull can break away and operate as independent vessels. The Fesarius, designed by Matt Jefferies, is the first alien vessel that ever appeared in Star Trek in TOS: "The Corbomite Maneuver". We do not know if Balok may have overstated his importance by making up the "First Federation", of which the Fesarius is the flagship. But after all, the huge vessel must have been built by a yet unknown civilization with advanced technical knowledge - even if we never hear of them again. Spock estimates that the Fesarius "must be a mile in diameter", while his sensors apparently don't work precisely enough. But as the Enterprise approaches and is still over 5000m away, we can see that each of the Fesarius's domes appears to be as wide as the saucer of the Enterprise (130m). This would give the Fesarius overall a much greater diameter than 1600m. The Fesarius was refined for TOS Remastered. The arrangement of the hull segments with its characteristic balls is still the same, as is the size relative to the Enterprise (at least roughly). 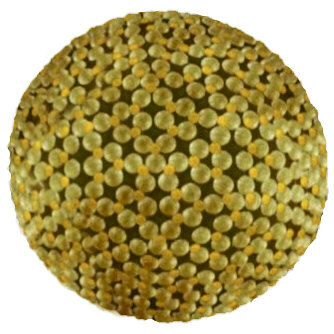 Most obviously facets were added to the previously smooth single balls that the ship is composed of. Also, a framework is visible between the balls. Although these features are new and were apparently not on the original Fesarius, we may attribute both to the crisper image quality. We could pretend that we previously simply couldn't recognize these details. Also, the color seems to have changed from dirty orange to golden. But the color may have just been corrected for an overly red hue in the old footage. A part of the Fesarius can break away and operate as a powerful independent pilot vessel and tug. The ship emits a bright light when it is powered up. If it normally forms a part of the outer hull, the "pilot vessel", as Balok himself calls it, is somewhat smaller in diameter than a tenth of the Fesarius mothership. With arguably several hundred of such ships of 2,000 metric tons forming the Fesarius, both sizes would be light-weight designs, compared to what we know about starship masses. It may be possible that the balls that the pilot vessel is composed of are actually a lot smaller than the domes of the Fesarius though. The alien ship appears to be overall smaller than the Enterprise when we see the two together. The pilot ship was reproduced for TOS Remastered analogous to the mothership. The glowing of the ship until it is disabled is now bright yellow instead of reddish. No specs on this small vessel are available. 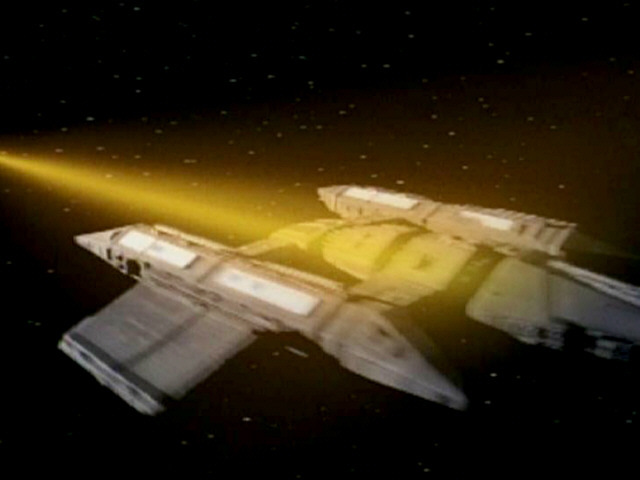 The ship appeared in DS9: "Improbable Cause", where its warp drive had been sabotaged by the Tal Shiar to be destroyed through a neutrino inversion. Frunalian science vessels are relatively small ships with characteristic diagonal "wings". 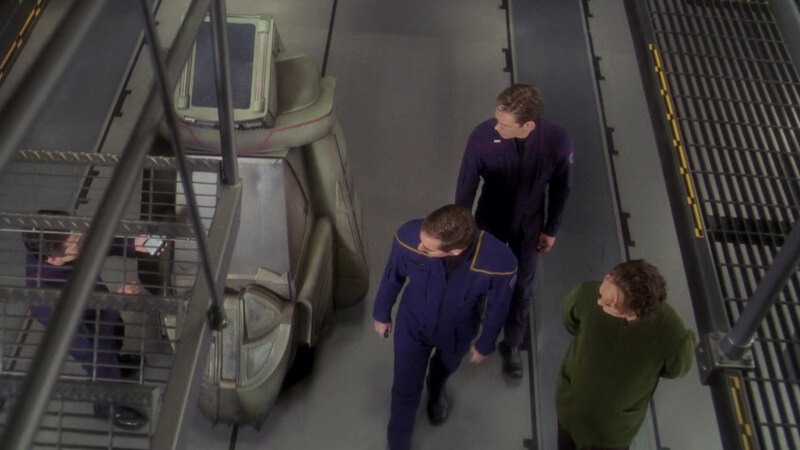 Three Frunalian science vessels arrive at Deep Space 9 in DS9: "Emissary". Since the Talarian patrol ship and warship look like closely related designs, the various later incarnations of the characteristic warships may be of Talarian origin. Nonetheless it is odd that the Frunalians have at least three ships of this design and have converted them to science ships. On the other hand, the Hekarans have done the same, maybe in a joined effort. The Gorn ship can be supposed to slightly slower than the Enterprise NCC-1701 and at least a match with regard to fire power. This CGI ship was inserted into the far background of the previously empty viewscreen for TOS-R: "Arena" in 2006. Only a main body and something like wings and nacelles are recognizable on screen. In the views of the CG model as posted at startrek.com the vessel seems to have four nacelles. The detailed side view of the CG model was created for the Official Starships Collection. This mighty vessel type was apparently used by the now extinct Husnock for planetary attacks. 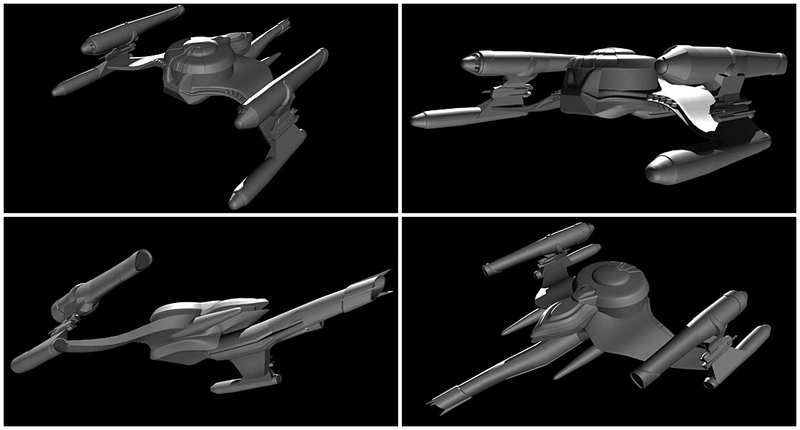 It boasts two weapons arrays on either side of the ship near the rear end, and one extendable array at the bottom. Kevin Uxbridge, a Douwd with supernatural abilities, extinguished the whole Husnock civilization after they had slaughtered the settlers on Delta Rana IV, including with his human wife Rishon (TNG: "The Survivors"). We never see an actual enemy vessel in the episode, but only an illusion created by Uxbridge. Although there would be no reason for exactly recreating a Husnock vessel for this hoax, it seems to be the most obvious assumption, seeing how powerful he is anyway. The Husnock race was evidently unknown to Starfleet prior to being extinguished. The Husnock vessel attacks three times. The second and third time we can make out an additional spike on the ventral side. 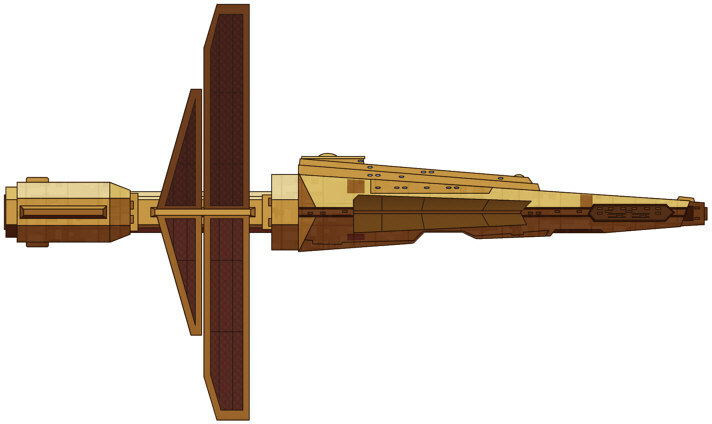 This is the configuration shown on the overall correct depiction of the ship in the Fact Files. The two blue beams from the lateral weapons arrays and the optional third one merge to one beam. Unmistakably there is supposed to be just this one Husnock ship, as positively identified by Data. Only that Riker notes that it looks "meaner" since its second appearance. Interestingly, we can see that there is a long deepening on the ventral side of the vessel in its original configuration. This is probably where the spike was later mounted on the miniature. But on the real vessel it could well pass as a hatch. Whether it is practical or not, the whole large spike looks like it was extended for the second attack. We know nothing about this ship, except that it has technology partially compatible to Starfleet's and that it is not sufficiently protected against the effects of the Expanse. Archer ordered a "warp coil" to be stolen from this vessel in ENT: "Damage" (extremely bad writing because actual warp coils are inside the nacelles, they are huge and it needs many of them to propel the ship). The ship was stranded in the Expanse, and the name of the aliens was never mentioned, although the credits call them "Illyrians". The CGI model had previously appeared as the Mazarite warship. Battle damage was added for the Illyrian version. If the unknown design were in any way related to the Mazarite ship, someone of the Enterprise crew would have definitely mentioned it, especially since they were performing a tactical analysis. This is a warp-capable shuttlecraft with two seats. The Iyaaran shuttle from TNG: "Liaisons" is an extensive redress of the Nenebek from TNG: "The Final Mission" and the J'naii shuttle from TNG: "The Outcast". It will later appear one last time as the Klingon Toron shuttlecraft. As the Iyaarans have made first contact with the Federation immediately prior to the episode, the shuttle is most likely not related to any of its previous incarnations. Fortunately the modifications to the shuttle are relatively extensive except for the characteristic triangular windows which are common to all incarnations of the mock-up. The registry BCD-31775 can be seen on the shuttle model, facing forward on the superstructure. The Federation registry makes absolutely no sense considering that getting one would hardly be the first thing the Iyaarans would do after establishing first contact. On the other hand, it sets a precedent for other non-standard registries mentioned on displays, part of which could belong to alien ships, rather than to ships of Federation member worlds. This is a small warp-capable shuttle with accommodations for two persons. The crew of this shuttle was rescued by an Enterprise shuttle from null space in TNG: "The Outcast". We can only see it for a brief moment, but the Taris Murn is another re-use of the versatile Nenebek (of the miniature in this case). The J'naii version (5th season) may be identical to the Yridian shuttle (6th season), but I assume they are different designs in reality. The color is not recognizable due to the bright light. It looks gray although the model is arguably still brown. The Kaelon warship is a relatively small vessel. Its combat strength remains unknown. Two warships appear in TNG: "Half a Life". The ship model was previously seen as Kivas Fajo's vessel Jovis in TNG: "The Most Toys". If we presuppose that the Kaelon military is not very advanced, we may believe that the designs are identical. Yet, new shots were filmed for "Half a Life", and here the ship is lighted somewhat differently than in its original appearance in "The Most Toys" and in the various re-uses of this footage. The escape pods of the supply ship are apparently built for only one person. The pod (ENT: "Oasis") had only one visible seat. I doubt that there may have been a second one, back to back with this forward seat. This freighter is equipped with holoemitters. Its hull is made of duratanium. 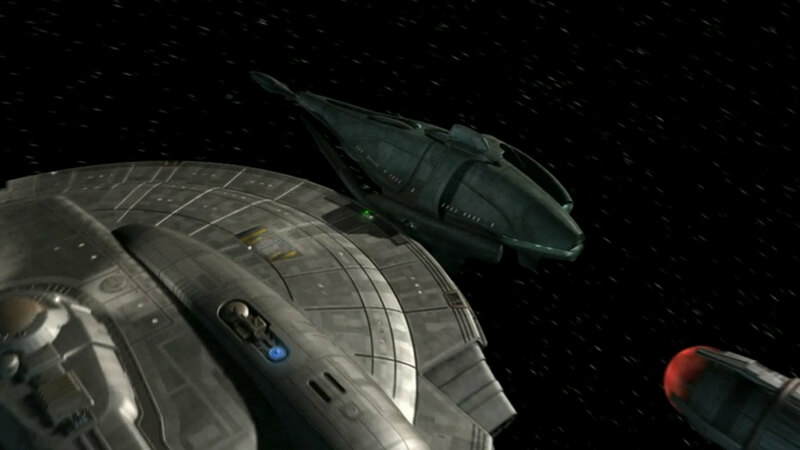 Ezral's ship is the same CGI of the "hammerhead" design that has previously appeared as the Nuu'Bari freighter in the Delta Quadrant. By no means these two designs should be the same. But it may not be too far-fetched to claim that Ezral's ship could be related to the freighter design 2 used by the Bajorans and by other races of the Alpha Quadrant, although they would be 240 years apart (Ezral's ship crashed in 2130). All these ships were consistently shown as obsolete. The only real problem is the holotechnology used aboard the Kantare ship, but this impairs continuity irrespective of the ship design. There are no specs on the Klaestron ship, except that it can outrun a Federation runabout. 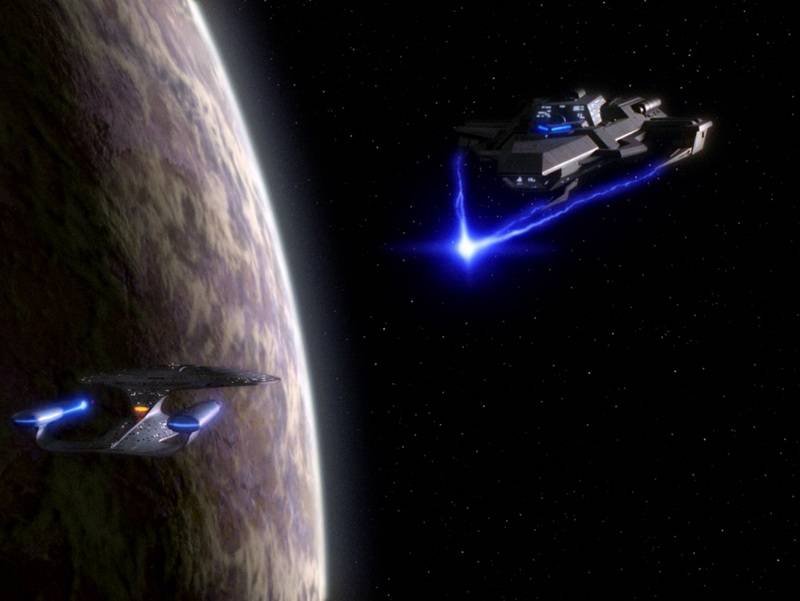 The Klaestron ship appeared in DS9: "Dax". It is an essentially identical re-use of the Tamarian vessel from TNG: "Darmok". Only the color of the engine glow was changed from red to blue, and it was shown from the top (bridge module up). 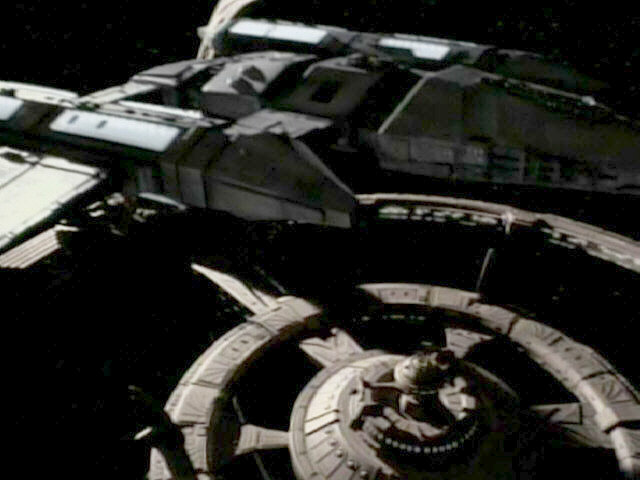 Since the ship is also considerably smaller (it was shown in relation to Deep Space 9), it has to be a distinct design. 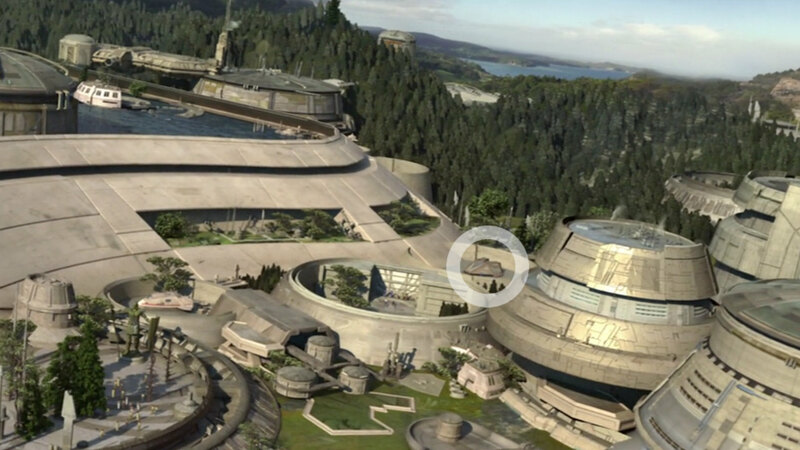 The Kostolain ship may be on a low technological level, although we don't know anything for sure. The ship showed up in TNG: "Cost of Living" and carried the Kostolain ambassador. It had previously appeared as Pakled ship Mondor in TNG: "Samaritan Snare" and as Acamarian ship in "The Vengeance Factor". All shots of the Kostolain ship are stock footage from the latter episode. Nothing is known about the Kovaalan ships, except that they are at least moderately armed. At least six of these ships attacked Enterprise in ENT: "EÂ²". The model previously served as enemy ship in ENT: "Silent Enemy". It is unlikely that the latter aliens were supposed to be the Kovaalans, though. No details on the fish-like Kreetassan ship are available. The Kreetassan ship appeared in ENT: "Vox Sola". 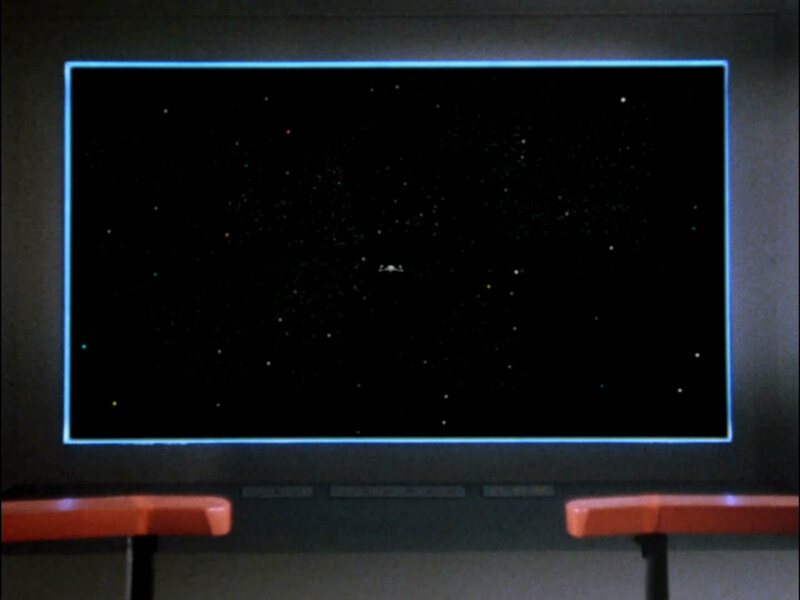 We could see it once more above the Kreetassan city in "A Night in Sickbay". No details on this shuttle of the size of a Starfleet shuttlepod are available. A shuttle is visible on a landing platform on the Kreetassan homeworld in ENT: "A Night in Sickbay". It is apparently a re-use of the Suliban shuttle from ENT: "Detained" with a different color but most likely meant to be Kreetassan. Nothing particular is known about the Kressari freighter. 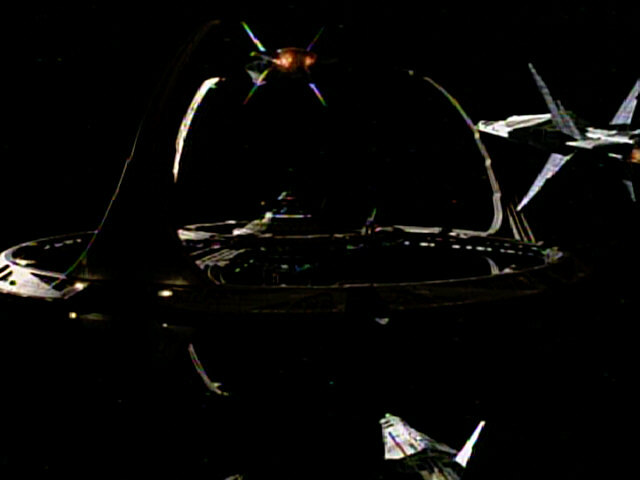 The ship appeared in DS9: "The Circle". The Kressari are yet another race using the same versatile design as Kivas Fajo's vessel Jovis in TNG: "The Most Toys", the shots are stock footage of the Jovis. However, the Kressari ship can be seen flying "backward"! The stern of the Jovis is the bow of the Kressari vessel, and consequently the lighting of the engines was removed. Whether we believe that the Kressari have modified this common vessel type to fly backward or whether it is an entirely different type of vessel is probably a matter of taste. Nothing is known about the battlecruiser, only that it is about as long as Enterprise NX-01. There is no way that the Kriosian battlecruiser (ENT: "Precious Cargo") could be in any way related to the visually mostly identical Akritirian ship (VOY: "The Chute") which will be encountered in the Delta Quadrant more than 200 years later. In only three episodes altogether the Kriosians have been retconned twice. In TNG: "The Mind's Eye" they were not shown, but said to be a Klingon protectorate. The Kriosians in TNG: "The Perfect Mate", on the other hand, were apparently independent, but with very outdated technology (which is why they needed the help of the Federation). 220 years earlier, we see that the Kriosians are a technologically advanced empire. What a shameful decline. The Kriosians are obviously using ships of Talarian design. This type of Kriosian ships appeared in TNG: "The Perfect Mate" as stock footage of the Talarian warship. Since the Talarian patrol ship and warship look like closely related designs, the various later incarnations of the characteristic warships may be of Talarian origin. 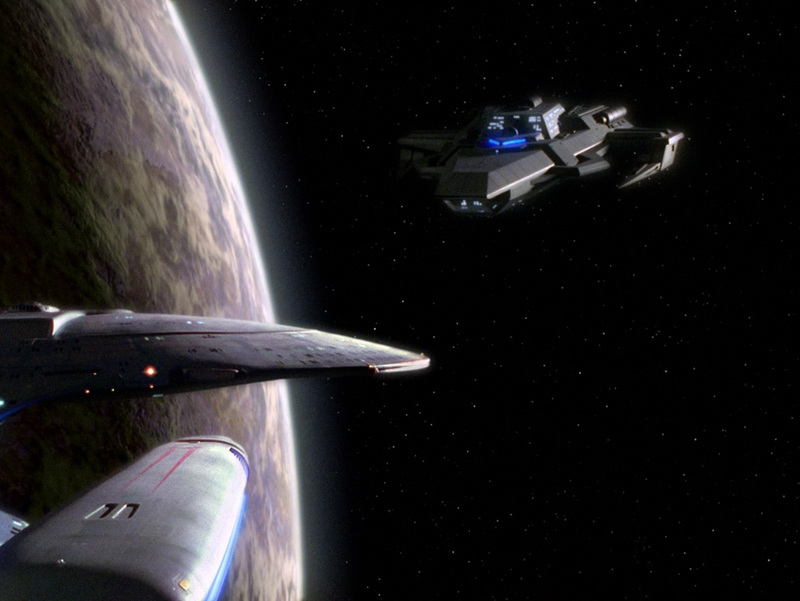 Due to a VFX error in the TNG episode we first see a Talarian observation craft (the one with the upright wings) that floats in space alongside the Enterprise. The next scene takes place in the transporter room where the Kriosian ambassador says good-bye to Picard. After that we see the ambassador's ship leave, but this time the Talarian warship (the one with the diagonal wings) is shown. We may decide in favor of the warship which was on screen for a longer time. There are no specs on the Ktarian ship except that its firepower is substantially inferior to that of a Federation Galaxy class. The Ktarian ship from TNG: "The Game" is an unchanged re-use of the Zalkonian warship which appeared as the Tarellian vessel in its original form. 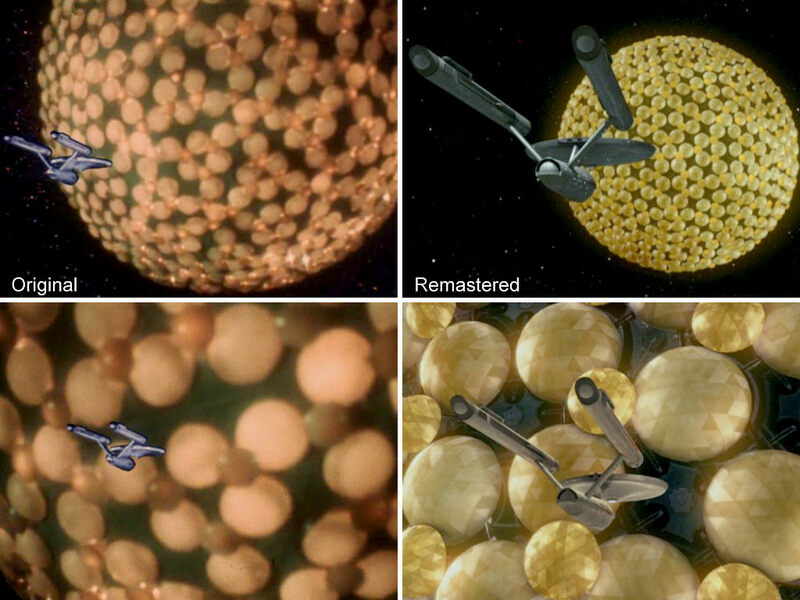 In the first take, the Ktarian ship appears upside down, but it is subsequently flipped to the same orientation as the Zalkonian vessel, obviously because it is partially stock footage from TNG: "Transfigurations". These "evil" Ktarians may not be the same race as the Ktarians in many references and on Voyager. Read here.